This honeycomb arrangement of vials provides better protection to prevent breakage. It has also decreased the voluminous case to a smaller footprint to save on freight cost and on storage space. The upward facing arrangement allows for easier placement from the case to your vial tray. Simply place the box at an angle, start from the top and transfer to your vial tray. Now with the new tear-away design, the vials at the bottom of the case are just as accessible as the top! Every vial and bottle needs a closure, right? Why not order them all together with one part number? 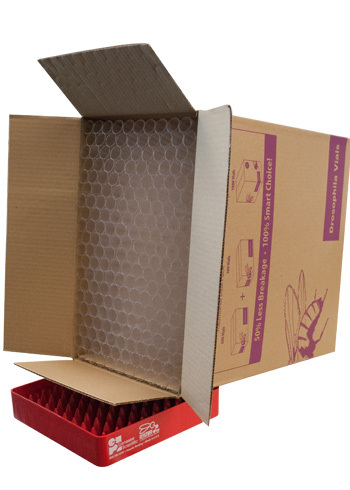 Now you can with our new Drosophila product bundles which will simplify your ordering. Just order using the catalog numbers below and you will receive the vials or bottles you need and an identical amount of closures. It’s that easy. Using narrow vials and Flugs? We have a bundle for you. Using bottles and cotton? We have a bundle for you. Introducing a truly revolutionary breakthrough in Drosophila research products: the new fly vial reload system. The system saves valuable time, is environmentally responsible and economically priced. This patent pending product will change the face of how plastic vials are purchased and used. The reload system tray is precision plastic injection molded and features a self-contained divider/partition system. 100 plastic vials can be loaded in seconds into these unique trays. The vial stacking plates are made of RPET which have a recycling resin code of “1” and can therefore be readily incorporated into any recycling program. Unique plastic partition system now makes reload vials compatible with any tray: cardboard, aluminum, plastic, stainless steel. These quality Drosophila vials are precision molded from premium grade polystyrene, K-Resin or polypropylene. All of Genesee Scientific fly vials are conveniently offered in either tray pack or bulk pack configurations. The tray pack 10 x 10 row configuration is great for quick, effortless filling. The bulk pack vials are layered with open-end orientation for convenient handling and smaller case size. Polystyrene fly vials offer glass-like clarity for excellent visibility. These fly vials are a safe and cost-saving alternative to glass vials. Polystyrene vials are not autoclavable. K-Resin fly vials offer glass-like clarity and rugged durability. This unique material is highly flexible, virtually unbreakable and scratch-resistant. Therefore, K-Resin are an excellent choice for shipping Drosophila. K-Resin fly vials are not autoclavable. Polypropylene fly vials are fully autoclavable. These virtually indestructible fly vials offer good clarity and cost savings. Master Cases Quantities! To best protect these vials during shipping, we have designed special durable boxes to fit multiple cases of Drosophila vials. We encourage customers to order vials in multiples of master case quantities to help protect shipments and reduce freight costs. Strength and Durability: Our plastic trays for narrow vials, wide vials, or bottles are impervious to moisture; inert to nearly all acids, chemicals, detergents, grease & oils; and withstand temperatures between –28°C and 110°C. Made of extruded twinwall high impact polypropylene copolymer resins, not only are these trays lighter than common cardboard trays, they offer a 10-fold strength advantage which significantly increases structural integrity and decreases “edge crush”.